I have a confession to make. I have never met a Manchester terrier in person. But chances are that many of you haven’t either. Here is a fun fact for you though, looking at the image you might guess that this guy has some Doberman in him, but NO. ONLY two breeds are involved. Black and Tan Terrier and the Whippet. And did you know that the Doberman was developed in Germany in the 1860s and is thought to be a cross of: old shorthaired shepherds, Greyhounds. Beaucerons, German Pinschers, Rottweilers AND the Manchester Terriers. So while they look similar the Manchester terrier most likely contributed to the Doberman look ! Here is another important fact : The Manchester Terrier is the OLDEST known terrier breed. And yet that history only goes back to the mid 19th century in Manchester UK. The Doberman comes from a similar time ! There are two versions, the toy and the standard, with the toy being tiny at only 2-3 Kg and 30 cm tall. 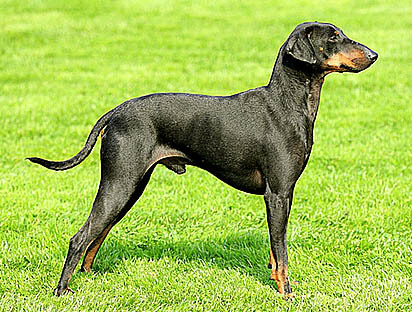 The Manchester terrier is one of the smaller and first terriers and classed in the TOY category of the AKC. You may have guessed from the toys size that even in standard configuration they are not that large. And that their primary purpose was as a rat catcher. These are tenacious formidable hunters that were also bred to kill foxes, rabbits, badgers. They are a little unique in that besides being one of the oldest terriers, they also hunted vermin above and below ground. Also unlike many hunting dogs, the Manchester terrier has good listening skills to its owner, making training for hunting easier than many hunting dogs. As you can imagine the toy variety has lost its appeal for mice and rat catching in the urban environment. Though be aware that this tenacious hunter is hunting instincts buried deep within its core, so that when sold as a companion animal daily socialization is necessary and they can be difficult to keep along with cats unless raised with a cat. While many people will find the look cute, these are fast, agile intelligent hunters born to kill vermin. Without regular exercise and above average leadership from their owner they can become aggressive and dominant in the house. Without exercise their intelligence and desire to be with a pack or human family can lead to considerable separation anxiety with its many bad side effects for the dog and the neighborhood. Love them, but discipline them and treat them with respect. They are toy in size but not in nature. ← Dog treats and hunting dogs, why?